In the question What's the spiral pattern on this satellite? I show this image of a spiral-shaped pattern on the spherical surface of a (presumably) vintage satellite or model thereof. @OrganicMarble's answer links to an article which identifies this as a logarithmic spiral antenna. In this answer I show this image of a project ELINT satellite aka GRAB-1 (for an interesting story, read further there) which @OrganicMarble pointed out is the little one on top, and the one with the spiral pattern is another satellite of the same type as that above. I'm wondering why these spiral-shaped antennas were actually necessary. Does it have to do with limitations of the electronics, or the nature of the RF signals, or the spherical shape of the spacecraft, or something else like "packaging"? This BBC photo does not show a replica of Vanguard-1, what might it be? Puzzler: Is this a Sputnik? 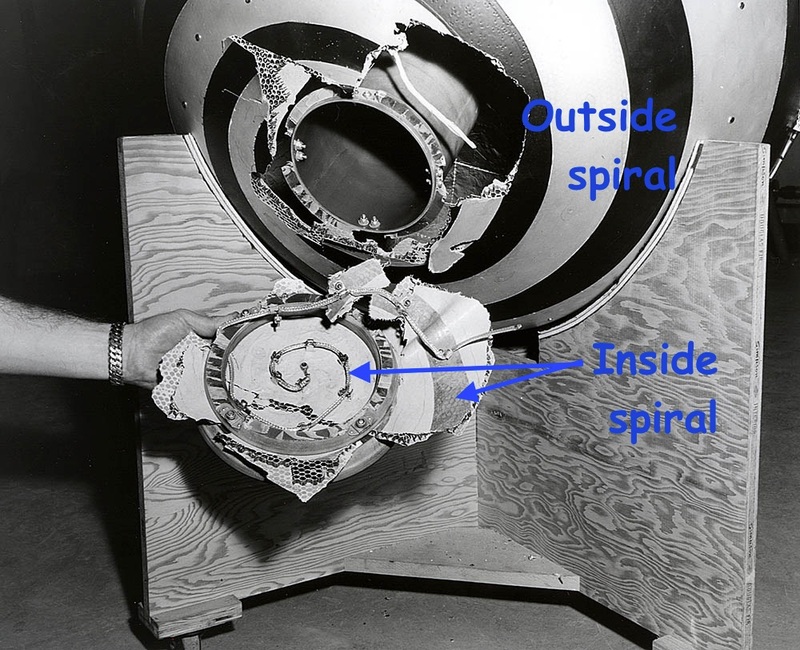 Question: Why were the antennas on the spherical surface of some early satellites spiral-shaped? Spiral antennas belong to the class of frequency independent antennas which operate over a wide range of frequencies. Polarization, radiation pattern and impedance of such antennas remain unchanged over large bandwidth. ... Spiral antennas are reduced size antennas with its windings making it an extremely small structure. So, an antenna that can operate at a large frequency range with a nice predictable performance, and with a small footprint. All desirable qualities for an antenna to be used in a spacecraft. For the Transit navigation satellites, I'll have to make a guess. The early Transits were launched on Scout rockets which meant severe constraints on size and weight. That makes an antenna that can be painted on the sat's outside surface an attractive option. Their function doesn't seem to dictate a wide frequency range: it broadcast on two fixed frequencies. @Hobbes' answer is correct about the what, but not the why. Radio waves -- just like light -- are electromagnetic waves. Because they are transverse waves of the electric and magnetic fields, they can be polarized. There are two ways (*1) to polarize E-M waves: linear polarization and circular polarization. The electric field vibrates in one direction perpendicular to the direction of propagation, but with an amplitude that fluctuates periodically. The electric field maintains constant amplitude, but the direction changes as the wave propagates. 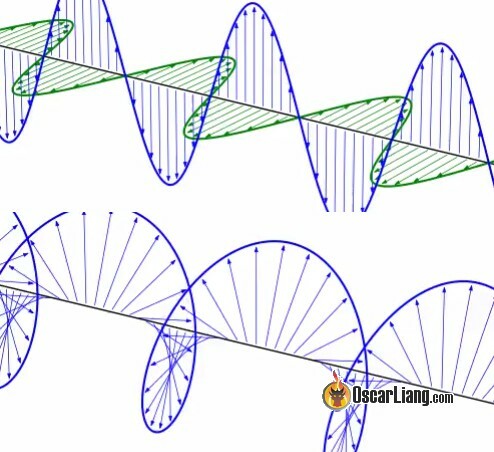 When E-M waves reflect off smooth surfaces, they can become linearly polarized. The best example of this is glare, which is light that reflects off a road, snow, or ground. In this case, the electric field perpendicular to the surface is reduced by destructive interference, and so we say the reflected light is polarized parallel to the surface. By wearing polarized sunglasses that are vertically polarized, you can block the glare, yet still see the ambient light. The same destructive interference by reflection can also happen with radio waves. Television, radio, and WiFi are transmitted by dipole antennas that create a radio wave polarized in the direction of the antenna (vertical in the case of TV and radio). However, when the signal reflects off certain geographic features, you can get cancellation of the linearly-polarized signal. This is why some locations have a hard time getting TV or radio signals. However, this problem doesn't happen with circularly polarized signals. Another issue with linear polarization is that when you rotate the transmitter (or receiver), the amplitude of the signal changes. If you tilt your head while wearing polarized sunglasses, the glare will start to appear. You could make a 3-D movie with linearly polarized glasses (one eye horizontally- and the other eye vertically-polarized), but you would see double-images if you tilt your head. It's also why the antenna on your WiFi router can be rotated into various orientations. This is another problem that doesn't happen with circularly polarized signals. Thus, 3-D movie glasses use circular polarization. The disadvantage of spiral antennas is that they are inefficient. They tend to spread their signal in a wide beam, which means much of the energy of the radio transmission is being broadcast in the wrong direction. As @Hobbes notes, they can transmit on a wide bandwidth; you don't want to do this as it requires more transmitter power. Putting a spiral or helical antenna on orbiting spacecraft is a smart idea. It creates circularly-polarized radio waves, which means the orientation of the antennas don't matter. That's important for an orbiting spacecraft, which is constantly changing its orientation relative to positions on Earth. There is also the advantage of circularly-polarized wave being less susceptible to interference by reflection. You can see a picture of a helical antenna on a ground-tracking station in my answer here. In contrast, spacecraft beyond orbit -- think Apollo or Voyager -- have fairly stable orientations, and so they use more efficient linearly-polarized antennas. That's why Apollo had so many dang antennas: some for when the orientation was stable (*2), and others for when the orientation was changing (*3). (*1) Elliptical polarization is a third way to polarize E-M waves, but they add nothing to this discussion. (*2) CSM to Earth (trip between Earth and moon); LEM to Earth (on the moon); the S-IVB ("third stage") to Earth; and the ALSEP experiments left behind. (*3) CSM to Earth (Earth or lunar orbit); LEM to CSM; LEM to Earth (ascending/descending); lunar rover to CSM. isotropic with no strong nulls, worst case is -10 dB. 1-A     17-Sep-1959      54/108 MHz, 162/216 MHz, 108 MHz (TM). 8Kilgus, C. C., "Resonant Quadrifilar Helix Design," Microwave 1. l3 (12), 49-54 (1970). 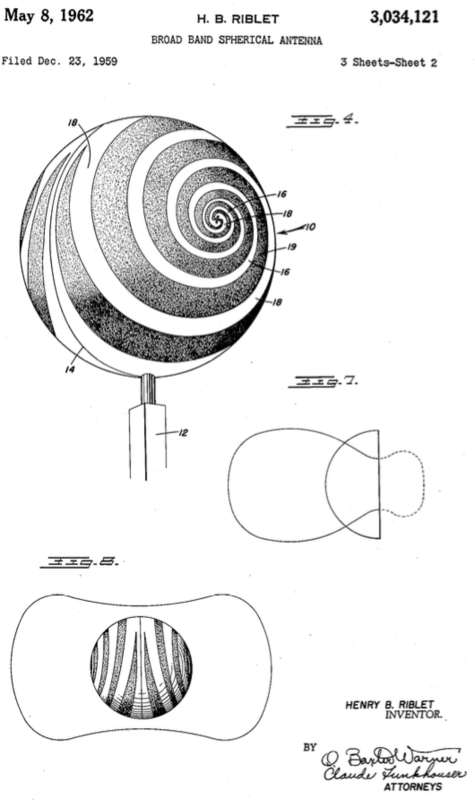 The requirement for a broadband antenna, covering a frequency range of at least four to one and providing radiation characteristics which would produce no nulls greater than l0 db with respect to the maximum in any plane, and at any angle with respect to the antenna within a spherical boundary, was generated by the development of a special spherical aerial vehicle. This requirement was so imposed that regardless of the attitude of the vehicle in space, the received signal variation would not be greater than 10 db due to antenna pattern changes. The design of the antenna constituting the present invention is based on the established properties of the class of broad band antennas using equiangular spiral slots or conductors. Such an antenna has the property that its shape is specified entirely by angles, so that its performance is independent of wavelength. A familiar example of such an antenna is the infinite biconical horn. The logarithmic spiral has the property that an angle between the tangent tangent to the curve and its radius vector is a constant and greater than 90 degrees. Such a spiral is shown in FIG. 1. A spiral slot antenna can be constructed by plotting two spirals slipped in angle with respect to. each other, as shown, in FIG. 2. Similarly, as shown in FIG. 3, a double spiral slot can be produced by plotting two spirals (FIG. 2) 180 degrees with respect to each other. In FIG. 3 the feed points are shown at X-X. The present invention contemplates the application of a logarithmic spiral antenna to the surface of a hemisphere rather than to a flat surface or sheet as in conventional practice. More specifically, and as shown in FIG. 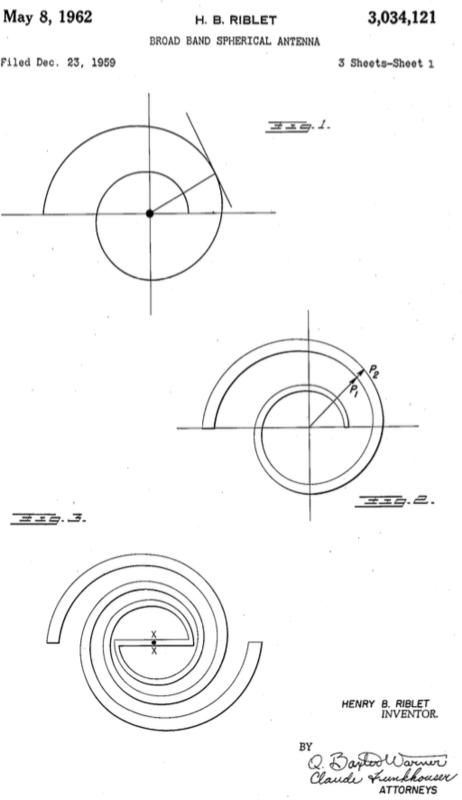 4 of the drawings, the present invention utilizes a pair of concentric logarithmic spiral antennas applied back to back The sphere is shown at 10 and is mounted on a suitable support 12 which also carries the feed line, to be described hereinafter. passes through the equator of the sphere, indicated at 14, and is "thus positioned normal to the polar axis of the sphere. Suitably secured to or formed on each half of the sphere is a pair of concentric spiral logarithmic antenna's elements 16 and 18 separated by dielectric filled in FIG. 3. When the two spirals which are fed independently at the poles are fed in phase, by equal length lines, from a common point and the radiation components are in phase all around the equator, the radiation pattern is a figure of revolution about the polar axis. Not the answer you're looking for? Browse other questions tagged communication history design spacecraft-development antenna or ask your own question. Why were Space Shuttle astronauts able to walk off the orbiter? Why were we able to have a more or less real-time conversation with the Moon? What were some of the first two stage rockets flown? How were polar or retrograde satellites launched in the early 80s? 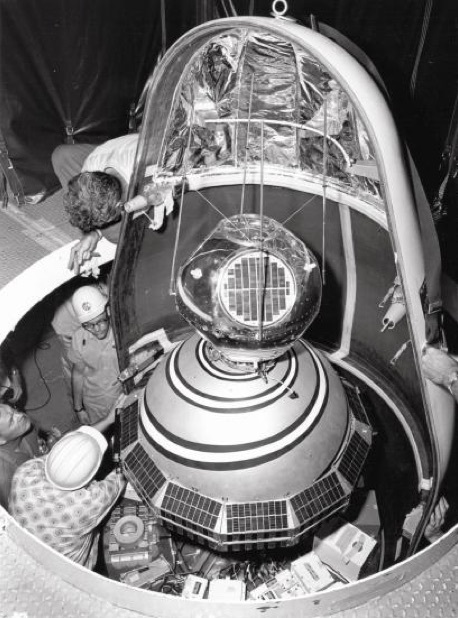 What satellites were launched into a polar orbit from Cape Canaveral in the 1950s and 1960s? Why were the Sputniks launched to such high apogee? Why were some Launch Complex numbers skipped?